A King’s Cross ‘pie bar’ from the mini-chain. 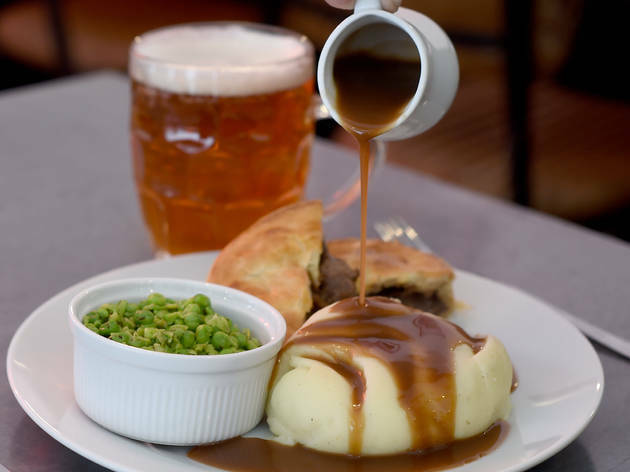 A King’s Cross outpost for the pie mini-chain, the look at Piebury Corner is surprisingly trendy. 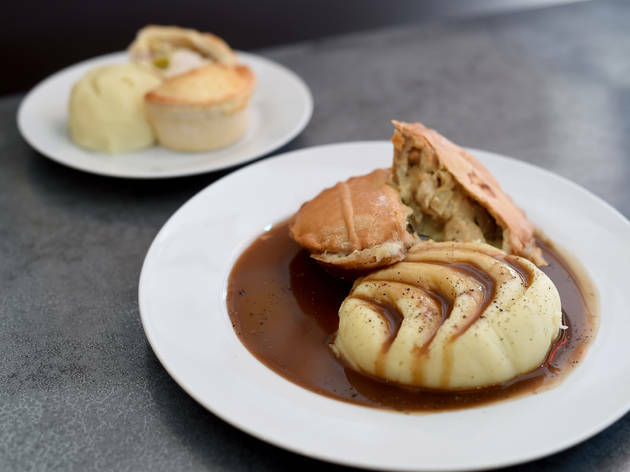 Piebury started life as a stall serving pies to fans outside Arsenal’s Highbury Stadium (geddit? ); this branch – its third – is billing itself as a pie ‘bar’. The name is spelled out in pale pink LED lights across one white brick wall, there’s booth seating and a cute mahogany-topped bar. The vibe is relaxed; at one point on my visit, I catch my sweet, very energetic waiter doing some sort of pull-up on said bar. The menu features classic pies alongside a pretty hefty gluten-free and vegan selection. The Sigourney Weaver pie (both V and GF) had a moreish crumbly pastry, while a veggie chickpea and beetroot ‘scotch egg’ was rich and warmly spiced, tasting a little like kedgeree. 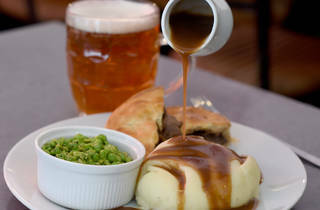 Of the classics, the ox-cheek pie was lovely and gamey. There was also a plate of roast potatoes that looked distinctly ordinary, but were actually exceptional: crisped up and garlicky on the outside, white and fluffy within. Less good was the £5 scotch pie: it was small and salty, with a thin, brittle pastry. 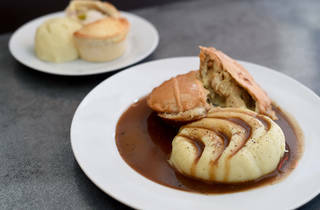 In fact, one thing to bear in mind at Piebury Corner is that all the pies are titchy and averagely priced at £7.50 – which feels steep. Still, this is a nice place for a pie if someone else is buying. Dinner for two with drinks and service: around £50.